The wet British weather mirrored that of the River Pageant yesterday in Battersea Park. But I had to make a return trip to see David Hockney’s Brushes App painting which had been added to the “Artists of the River Pageant” at the Pump House Gallery. 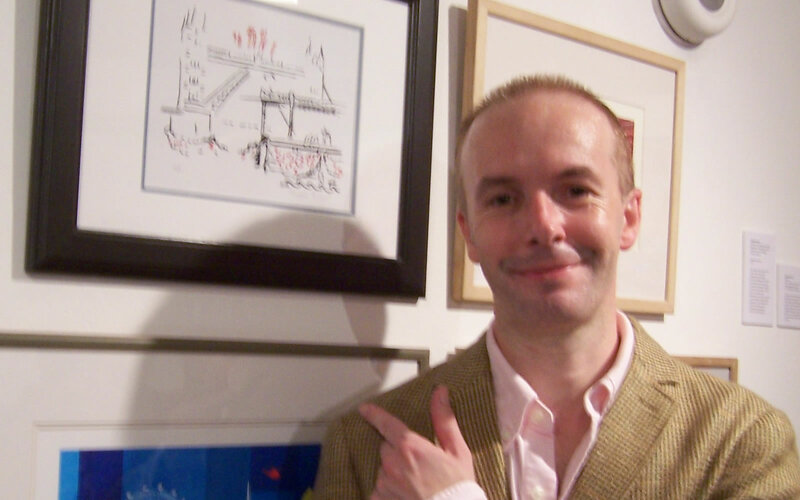 The prestige of my drawing of the Jubilee, being on display in the same exhibition as this expressionist pioneer of Pop Art had me taken aback all week! Heightened color, an enthusiasm of mine, emanates from David Hockney’s iPad paintings, not even so much of sunny Californian Yosemite, but of East Yorkshire; that’s when you know an artist really ‘sees’ into another realm. My charcoal and oil pastel art of the Queen at the pageant ironically has little color this time. But I feel I heightened instead, what I call ‘light energy’. On that dreary day, in his style, David Hockney squeezed out all those colorful protons and neutrons, so much so, that the Queen’s white, crystal studded coat appears as gold. 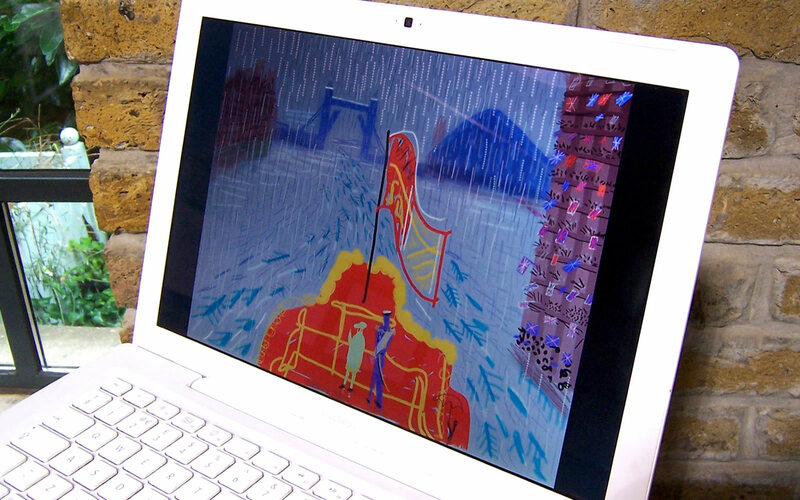 Some may think it is déclassé for me to say this, but I make no apologies for enjoying Disney, so when I first saw David Hockney’s vintage cartoon-looking Tower Bridge in “The End Of The Regatta,” the color styling of Walt Peregoy in 1961’s “One Hundred and One Dalmatians” came to mind. And that’s not an indictment against David Hockney’s work either, I believe art should ‘bless’ and deliver ‘happiness’ to the observer. 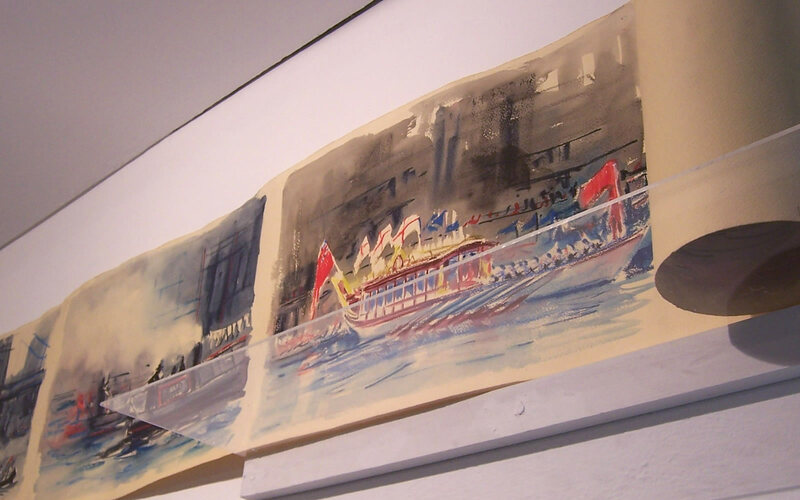 And speaking of being happy, my Hand Embellished art print on display has been sold to a lady who lives on the Thames! The exhibition runs until Sunday September 15th 2013. Navigate your way to the top of a Victorian tower in Battersea Park by September 15th and you’ll find my “Diamond Jubilee” art on display. 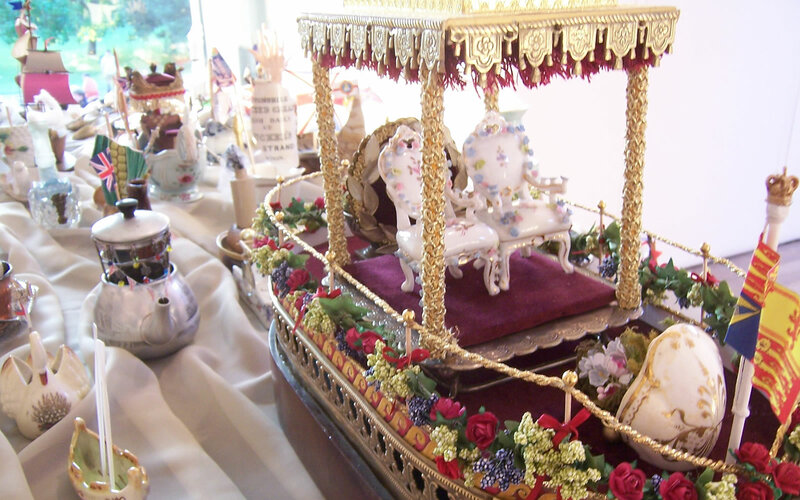 You’ll also discover a table full of teapots, crockery and bottles which pay homage to the Queen’s flotilla from the Turner’s House Artist in Residence, with whom I got to speak (below). 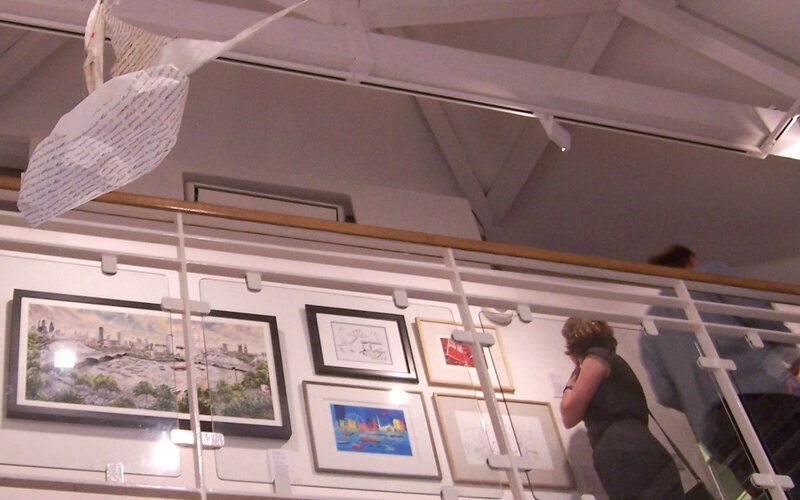 So why not get underway to the Pump House Gallery for this Thames Festival free art exhibit, or if you’re high and dry see what was in the offing by way of my video from the Private View which was opened by Lord Salisbury! 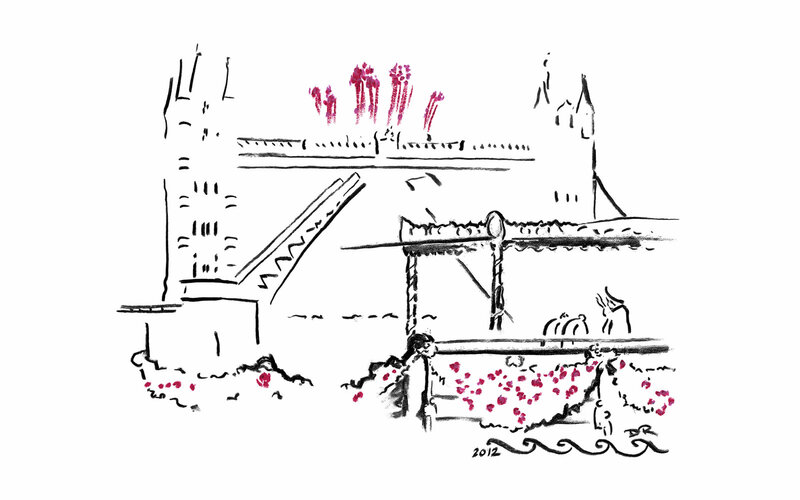 My drawing of the Queen on her barge will be one tiny part of a river-wide, ten-day celebration of the Thames, in London this September, which includes races, markets, and even unique opportunities to “Get on the River,” yourself. And although it sounds like part of a Disney movie, there will actually be a live operatic concerto “sung” by ships and boats, including a little tug between Tower Bridge and London Bridge on Saturday the 14th. My work will be exhibited in Battersea Park , which is right up against one of the Thames’ little beaches; with “over fifty works of art inspired by The Thames Diamond Jubilee Pageant,” at the Pump House Gallery, London SW11, each day from Wednesday the 4th to Sunday September 15th 2013, between 11.00am to 5.00pm.